Networks differ in their attack and error tolerance. Scale-free networks have a typical ‘error and attack tolerance’ (1), which is related to the distribution of nodes with a certain degree in these types of networks. Characteristically, scale-free networks contain many nodes with a relatively low degree (sparsely connected nodes), and a few nodes with a high degree (these are the hubs, Great Powers). In case of a random ‘attack’ on a scale-free network, or a random error of a node (a failing node) in such a network, the probability that a sparsely connected node is involved, is much higher than the involvement of one of the few highly connected nodes (sparse hubs). For that reason, the probable effect of a random attack or error on the overall network will be limited. However, the distribution of nodes in scale-free networks makes these networks vulnerable for targeted (directed) attacks; for attacks on (and errors of) one of the few highly connected nodes (sparse hubs). When (one of the few) highly-connected nodes are attacked (or fails), the effects will reverberate through the System, and cannot be contained (stay localized). The ‘same’ attack – on a single node – has is completely different impact. Attack and error tolerance of scale-free networks. Typically, a scale-free network has many nodes with a low degree and just a few nodes with a high degree: The degree distribution of the nodes of a scale-free network obeys a power law. 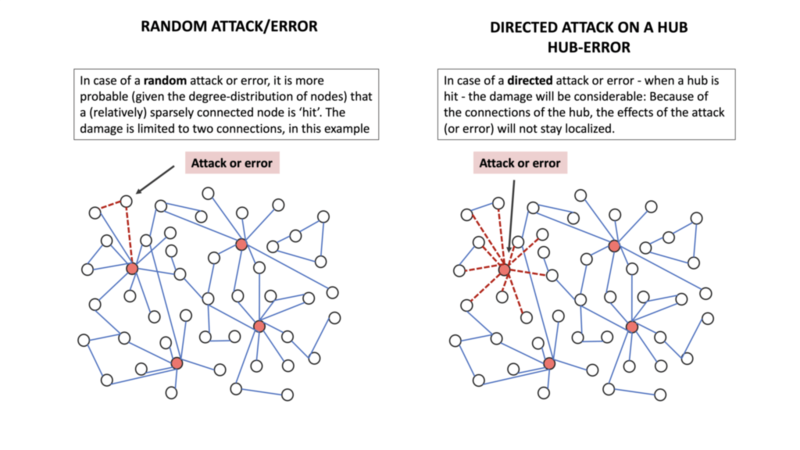 The probability that in case of a random attack, a node with a few degrees is ‘hit’, is much higher than the probability that one of the few hubs (highly connected nodes) is hit. In case of a random attack (left) a node with a low degree is hit and just two links are affected: The attack has a limited impact. In case a hub – a highly connected node – is hit, the impact is much more significant. Presently, the United States is the node with the highest centrality in the System (‘hub of hubs’); the System is now in the 1st cycle (I explain later) of the 2nd FTS (globalized State-System (1945-….)). At this stage, the 2nd FTS struggles to regulate the (State-)System; entropy (issues and tensions) is accumulating, and vulnerable clusters are percolating the System and become increasingly connected. Data-analysis shows (to be discussed later) that the current cycle had reached its tipping point in 2011. The United States is linked to – an integral part of – all increasingly connected vulnerable clusters in the System; in fact, the United States connects these clusters, and is instrumental in their percolation and in the increase of their correlation length of the vulnerable clusters. Because of the centrality of the United States in the scale-free System, the United States is very vulnerable for a directed attack (or error); such an attack will then ‘reverberate’ through the System, because of the configuration of the (network of the) global System. It seems, that the United States struggles with its entropy-regulation – its homeostasis – due to external and societal developments. In response, the United States now tries to reduce the influx of entropy by isolating itself from the (State-)System; a typical response to entropy-overloads. Because of the scale-free characteristics of the System and the centrality of the United States, its ‘repositioning’ – e.g. its decisions to disengage from current arrangements and obligations – impacts on the basic architecture of the current international order, on the (regulation of) EMIS-flows in the System and consequently on the configuration of the S/T-field. The State-System will (further) fragment and lose its consistency.